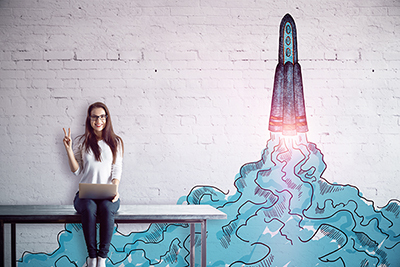 Many new entrepreneurs have this expectation that when they unveil their brand’s offerings to the world, people will come running to make a purchase. If you’ve seen the movie Fields of Dreams then you know the phrase “if you build it, they will come.” Unfortunately, when you’re an entrepreneur, this isn’t always the case. At least not right away. Some business owners are surprised at how much work and time goes into building a loyal following. Believe me, when I first started my own business, this fact left me unpleasantly surprised as well. But just because you don’t have customers knocking down the door for your services right away, doesn’t mean you’re doomed to fail. In fact, quite the opposite is true. With some grit and passion, you can continue to make your dream a reality. Here are some tips on how to do the heavy lifting required to make your business a success so you can banish new business frustration for good. Using email newsletters and social media as a tool to build your business can feel much safer than making cold calls or chatting up strangers at networking events, particularly if you’re a more introverted type (believe me, I get it!) but it’s certainly not the most effective way to build long-lasting client relationships. You can send perfectly worded emails and eye-catching social media posts all day and still not see money coming in the door. Once you’ve developed a solid following, these activities certainly can foster ROI. But until then, you’ve got to develop a face-to-face relationships with your customer base, otherwise you’re at risk for serious new business frustration. To build these relationships, create a process for getting yourself in front of your target customer base. This doesn’t have to mean attending stuffy events complete with sad cheese trays and nametags. It can be any type of event where you feel comfortable! Just make sure that the events you attend allow you to get in front of potential customers, and not just your colleagues. Where do your ideal clients spend their free time? What are their daily habits or routines? Who do they network with? Who do they hire to help them? When you’re able to build a clear picture of your ideal customer in your mind, marketing to them becomes much easier. Once you’ve carefully crafted your offering based on your customers’ preferences and needs, then you can unveil it and present a strong call to action. Not to mention have a list of people in mind to invite into it! Even the most qualified business owners will have ideas that are met with crickets. As an entrepreneur, you’ve got to prepare for this. Don’t anticipate rejection and failure, but prepare yourself for plenty of “no, thank you” responses or maybe some “not right now” responses. When you’re experiencing that new business frustration, you may wonder if you’re cut out to be an entrepreneur, or if there’s even a need for your brand in the marketplace. Remember that even “overnight success” business owners spent years doing the behind-the-scenes work (complete with false starts and failure) necessary to get them to that point. Understand that you have a choice.Where do you want to spend your energy? You can either berate yourself and continue to question whether you belong in this field, or you can approach all challenges from a place of positivity and resiliency. This is incredibly important when it comes to building your business. Take some time to think through the first six months to a year, and come up with action steps about how you’ll land clients. What are you offering? Why should they hire you? What are the most powerful ways to get in front of them? Who could you tap as a potential referral partner? From there, create a process to connect with these people and ask for what you need. Take measurable steps, even if they’re outside of your comfort zone, to push you towards your goals. For example, if you’re a coach looking to land speaking gigs, do your research and develop a large list of speaking engagements in your target market that you can apply to…then APPLY! Now is the time to get honest with yourself about the time you have available to dedicate to building your business. In the beginning, you often can’t afford to outsource work or delegate to others. That means you’ll need to build in enough time to get all necessary tasks done. From finding clients to invoicing and promoting your services, all of the weight falls on your shoulders. Life always gets in the way. You can begrudge it, or jump in with it! You probably have more free time than you think, but you’ll need to identify these pockets of time. You can get a lot done in the early mornings or late in the evenings when your family is asleep, for instance. You also probably spend more time than you’d like to admit scrolling through Instagram or watching tv. 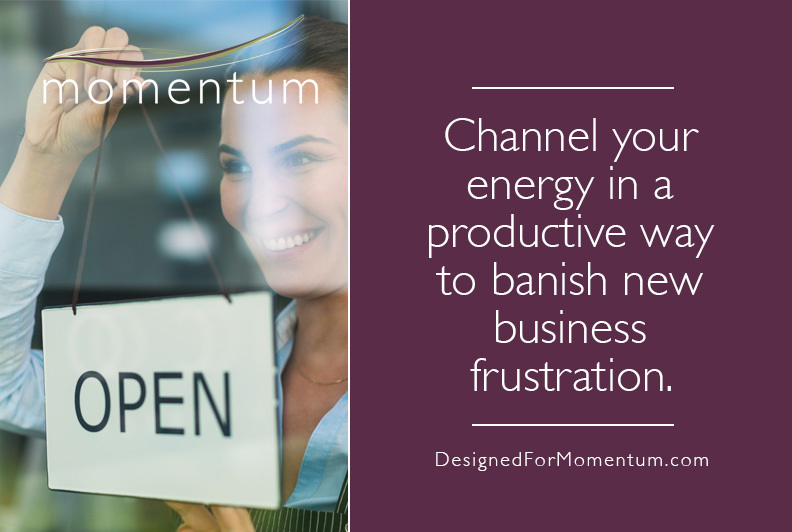 Channel this energy in a positive, productive way instead of letting mindless tasks steal hours from you, and you’ll be pleased with how much progress you’re making. If you’re a new business owner who feels you need a better foundation under you in order to really experience success, first of all, props to you for identifying this. It can be hard to admit our pain points and be willing to address them, but it’s a necessary part of entrepreneurship. Secondly, I’m here to help so you can say goodbye to new business frustration for good! 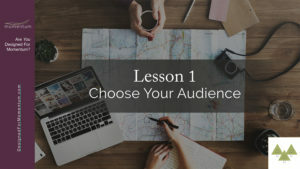 My Choose Your Audience training series is specifically designed to help you get clarity about your brand and boost the amount of money coming through the door. Interested? Click here to get more information!